OLD SCHOOL: Jack Hassler Co., Inc., Founded 1900, Union Shop. Anyone who has managed a restoration business through its first decade will understand the dedication and pride of brothers Frank and John Kenny, owners of Jack Hassler Co., Inc., now entering its eleventh. In 1900, when steeplejack Jack Hassler founded his company, many of the historic structures the Kenny brothers work on today had not been built. When asked what, apart from this remarkable longevity, separates Jack Hassler from the competition, John Kenny replies, “The very capable members of Local 1, Bricklayers and Allied Craftsmen. Their expertise allows us to take on the most demanding restoration projects, especially in masonry.” He agrees that the cost of union skills is higher but has found that his customers appreciate the difference. “Steeplejack rigging methods save the customer a lot of scaffolding money but they don’t always allow the owner to do a full, hands on inspection of the completed work. Who would you rather have doing the work under these circumstances, well paid, well trained union help or an unknown quantity?” It is a fair question if one certain to generate controversy. The union, John adds, furnishes members with OSHA and other technical training. Jack Hassler Co., Inc. limits its service area to two to three hours radius of their Philadelphia, PA base. They perform inspections, installations and a wide range of restoration services to any tall structure within this area. Their usual clients are churches, municipalities, schools and other institutions. Jack Hassler the man passed away sometime in the 1950’s and the company was acquired by Ev-Air-Tight Calking Company, both companies eventually passing into the hands of Frank and John’s father , a long time employee. The younger Kennys studied under master rigger Joe Broderick, now retired. The Kennys also own Ev-Air-Tight Calking Company, itself founded in 1919, considered the “parent” company to Jack Hassler. John Kenny acknowledges that “calking” is usually spelled with a “u” but insists, “Maybe they weren’t such great spellers back then, but they were great craftsmen and they knew everything that there was to know about the subject.” So “calking” it is, like we said, according to the old school. 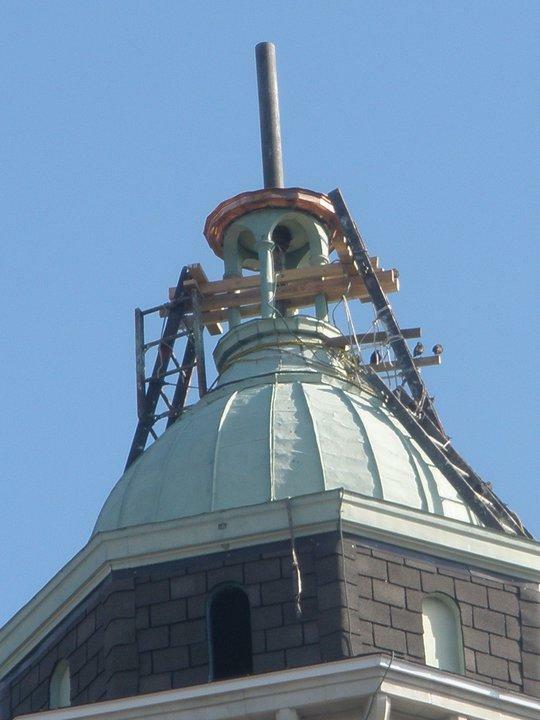 This entry was posted in Steeples and Towers and tagged Pennsylvania, Steeplejacks. Bookmark the permalink.